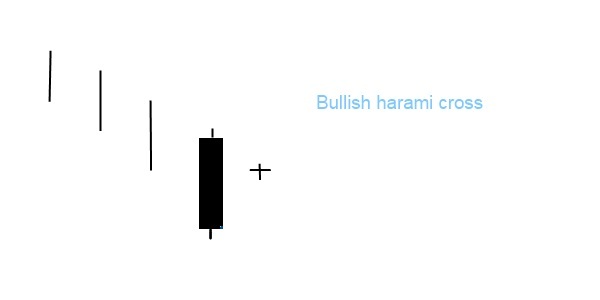 Bullish harami cross is a bullish trend reversal sign. The pattern consists of a black body followed by a doji that is completely engulfed by the prior black body. This formation appears in a downtrend. What happens on the market when a bullish harami cross forms? On the first day a large black candle forms, typically in the direction of the prevailing market trend. The second day closes at the opening price, a doji appears. While there is confidence and activity on the first day, the second day brings a sudden drop in activity due to market uncertainty. The low volume on the second day indicates that traders are lacking enough information. This pattern is relatively common, and is more significant than the bullish harami pattern.